The crown area is located in the posterior part of the scalp, specifically where the scalp starts to slop downward, this crown ends when the occipital bone begins (usually in hair transplant we take hair grafts from this occipital scalp especially when we are using FUT method). Sometimes we mention to this area by calling it the VERTEX which the highest point. 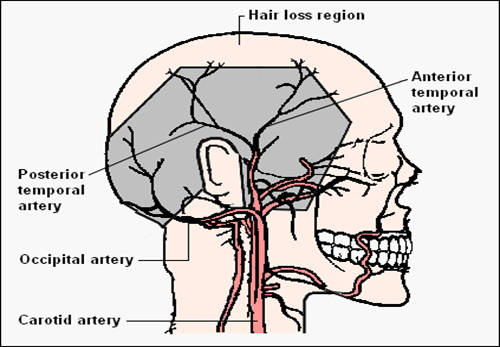 The picture below shows us the scalp arteries network. These arteries branch out to a smaller arteries then branch again to form blood capillaries (not shown in this picture). This blood capillaries are responsible for supplying the follicles with blood and nutrients that the hair need for the growth process. Evidently, the blood pressure and the flow rate will be much higher inside the bigger blood vessels in compare with the small blood capillaries. As we notice that this large blood vessels are located to the follicles that exist in the lateral aspects of the head more than the follicles that we find in the vertex. As a result, we will find that the blood pressure and flow rate inside blood capillaries that located in the lateral aspects will be little higher than the blood capillaries that located in the vertex area. A whorl is a point located in the crown area, where the hair grow in a circular pattern, either clockwise or counter clockwise. The shape of this whorl is somehow responsible for how we should transplant hair in this area. In some cases, we may have more than one whorl and this will increase the difficulties that we face during hair transplant surgery. Vertex balding is a part of general baldness. 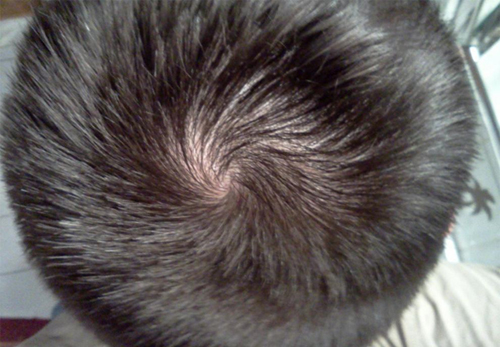 This baldness appear after it occurred in the frontal or middle area of the scalp. The importance of hair falling in vertex area differ depending on the patient age, it is effective in stages III vertex, IV, V VI and VII of the Norwood scale. 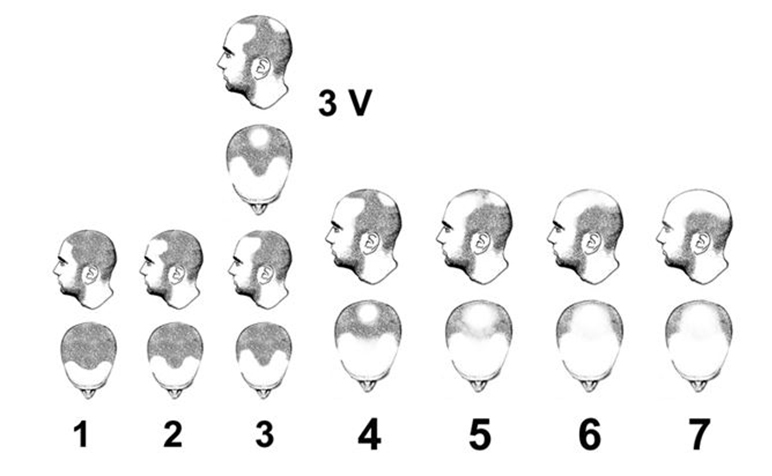 Between 18 and 29 years old, only 6% of Male Pattern Baldness is related to the vertex. Between 70 and 79 years old, 50 %. Sometimes hair falling happen essentially in the vertex, it starts from the center of the vertex then spread to the surrounded area. Later, it develop and take circular shape and gradually grow to the exterior area. The circular surface dramatically develop while the diameter of the circle is growing, as a result, we should be attention when we are judging the incomplete hair falling. Hair will keep falling in this area until we have a circle with a diameter 10 cm empty from hair. First: the existence of whorl point makes the hair grow from different angles, where the hair pattern in crown area should recreated in order to let the angle of hair transplanted match the angle of natural hair. Second: the hair must tightly interlocked to achieve the greatest amount of hair density, especially in the upper arc of hair where hair cascade on the other hair in the crown. Judicious graft choosing and placement will afford the best result for hair transplant in the crown area. Third: the donor area is an area that have limited number of follicles. On the other hand, the area of the crown is big and it need around 6500 grafts in order to cover it completely, this number is much bigger than the number that exist in the donor area. This large number will not leave any chance to restore the frontal line or the front area of the head in case of hair loss. Do you have hair loss in other region of the scalp? In spite of considering the crown area important for many patients, it is generally a less "cosmetically significant" compare to the frontal line and the front scalp. Fortunately, the crown is located in the upper part of the scalp near the end of the head, so most of people can not see it, whereas the frontal line is appeared for everyone. As a result, if you are having hair loss in the frontal line you should first treat this region then start with the crown area. How much donor area do you have that is available for the transplant surgery? The donor area is a limited area and if the patient is suffering from heavy hair loss, that means that the patient may not have enough grafts for covering the whole scalp. If you are planning to do a crown transplant and you have a limited donor area, you have to ask yourself this question " how I will look if I use all the grafts that I have in my donor area in order to do crown transplant and the I start to suffer from hair falling in the frontal part of the scalp?" the answer will be " of course, your hair will not look natural ". Having heavy hair in the crown area and suffering from hair absence in the frontal part of the scalp will give us an abnormal and uncommon look. On the other hand, we may see men have a heavy front line but suffering from some gaps in the crown area, this situation consider normal and we see it a lot. For this reason, if you have a limited donor area and you can only transplant one region in the scalp, we advise to focus on transplanting the frontal line because in this case you will have a normal look even if the posterior area is almost empty. 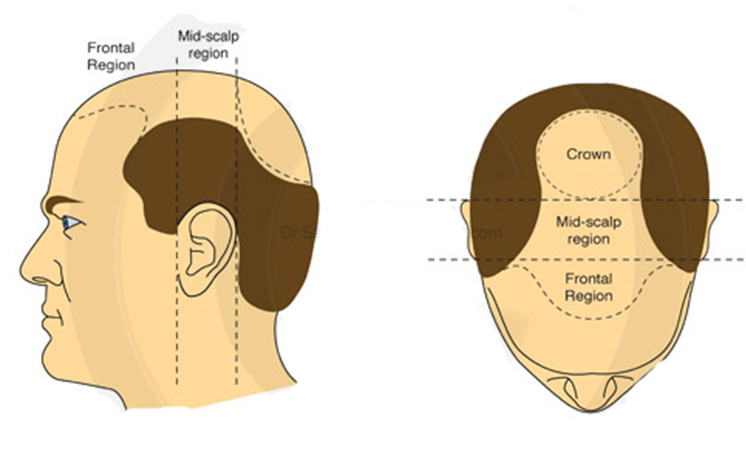 If the patient owned a full hair density in frontal area with gaps in the crown area of scalp, here we can evaluate the donor area in different way. However, it is difficult to predict how one's hair loss will progress and it is always wise to be sure that we have enough reserve grafts in the donor area for the front part. When we have youth patients we should be more accuracy while we are evaluating their situation before take any decision for crown transplant. Although a " bald spot" can be psychologically tough for a young man. Patients who suffer from thinning in this area may have more hair falling. If we use all the grafts in the donor area and then the hair start to fall, the patient will find himself with a heavy hair in crown area and baldness around the crown. When we have patients suffering from continuous hair loss and they have a limit number from grafts, we should deal with these grafts wisely. If the hair start to fall in the crown area, it is possible to falling in the frontal area also, As a result, we prefer to use the grafts for the frontal area and wait to see what will happen for the frontal area after the transplant surgery. In summary, crown hair transplant are tricky partially because the crown is a "moving target" because it progressive with time passing and bald circle is also growing. Patients should ask the doctor before take any decision in order to give him the right steps also give him some advices to get excellent results.